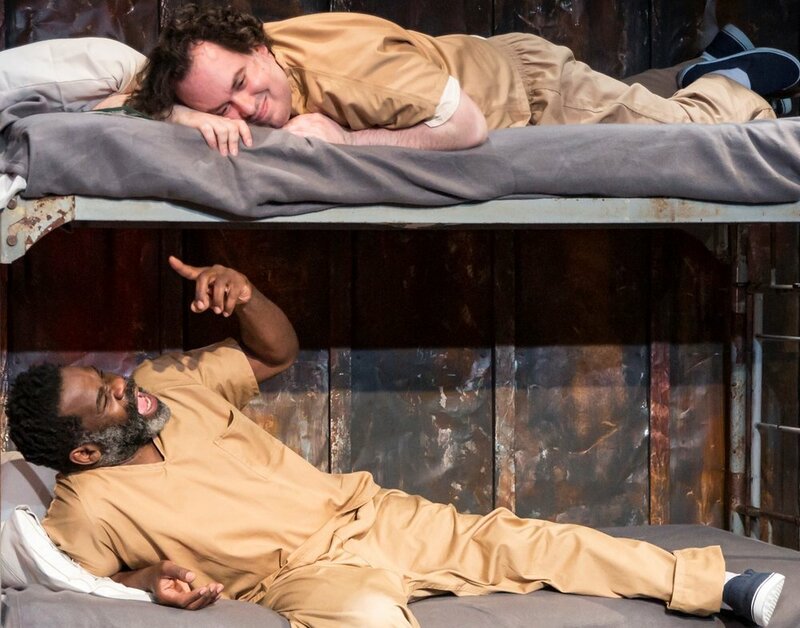 Ali Arkane (top bunk) plays Douglass and Craig Mums Grant plays his cellmate, Myron, in Lyle Kessler’s Perp. Top: Arkane with Tricia Alexandro (left) as police detective Jack and Paul Ben-Victor as detective Harvey. Doug, as he is also called, is not a hero on a grand scale, and Arkane’s performance is small and detailed as well. Doug is a simple citizen from Philadelphia, who was minding his own business collecting and studying bugs in the woods when he was taken in for questioning by police as a suspect in the murder of a jogger in the same woods. Don’t be scared, don’t be frightened, little earthworm, I mean you no harm. You are the lowest of the low, but you are also the Holy of Holies. You are the mystery we cannot comprehend. You are the Chosen One. The Messenger of God. And I hear your message. It’s one of love and acceptance. Crime drama is one of the most enduring popular genres, especially on TV, so the directorial decision to bring the essence of a TV cop partnership to the stage in Jack and Harvey’s banter works nicely, initially. The pace and punch of their quips is familiar and humorous, but alongside Arkane’s Douglass, who is so credible as a “real” person, it is jarring, making it difficult to buy into their romp. Javier Molina as Henry. Photographs by Edward T. Morris. Doug is the “good guy,” yet he is persuaded to plead guilty to the murder and is sent to prison. There he befriends his cellmate, Myron (Craig Mums Grant), and they pass the time playing checkers. Soon the tables are turned, however: the cops are the bad guys and the criminals are the good guys. Myron decides to help Doug escape and find the real killer: “I’ve been considering this for days, nights,” he tells Doug. “And I know what you need to do…. You need to return to the woods and apprehend the killer.” Myron helps him escape back to the woods, where Douglass encounters the real “perp,” Harry (Javier Molina). There is almost no surprise at all when Doug does encounter the killer because Perp is not about the actual crime and anxiety-producing plot twists toward the resolution of a mystery. It is about the search for the good in everyone, for morality even in evil deeds, and the ultimate power of love and light. Edward T. Morris’s clever scenic design of coarsely textured painted metal panels onto which lighting effects (Marika Kent) define details such as the high narrow windows in the interrogation room, and the trees in the woods, enhance the storytelling. Scene changes are punctuated by brassy, percussive jazz suitable to the genre (Matt Otto provided the music and sound design). The performances and the production’s overall simplicity harmonize with the play itself, to a subtle yet powerful effect. The power lies in daring to ask the audience to look at the complexities of human nature through the eyes of a child. And, like Douglass, to see as much good as we possibly can. Perp runs through April 11 at The Barrow Group (312 West 36th St.). Performances are at 7:30 p.m. Wednesday–Monday. Tickets may be purchased by calling (866) 811-4111 or visiting barrowgroup.com.